Pouches of tender meat and fish pieces in succulent jelly. Including Chicken, Salmon, Beef and Tuna. Whiskas put quality meat and fish in their recipes not only because cats love it but also because it is a great source of natural protein, vitamins and minerals. 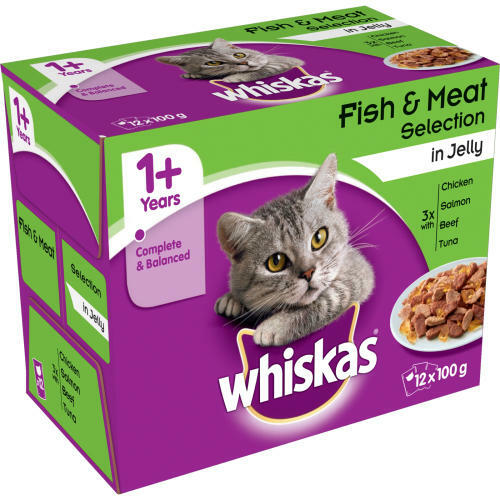 Each Whiskas 1+ pouch is bursting with succulent meat or fish pieces and contains balanced mineral levels to support a healthy urinary tract and zinc to ensure a healthy skin and glossy coat.These are complete 'wet' pet food pouches for cats, with a single serving per pouch. Easy to open, and no mess! •	100% complete and balanced nutrition. •	Made with high quality ingredients. •	No artificial flavourings or preservatives. •	A perfect balance of vitamins & minerals. With Salmon: Meat and Animal Derivatives, Fish and Fish Derivatives (including 4% Salmon), Minerals, Various Sugars. With Beef: Meat and Animal Derivatives (including 4% Beef), Minerals, Various Sugars. With Tuna: Meat and Animal Derivatives, Fish and Fish Derivatives (including 4% Tuna), Minerals, Various Sugars.